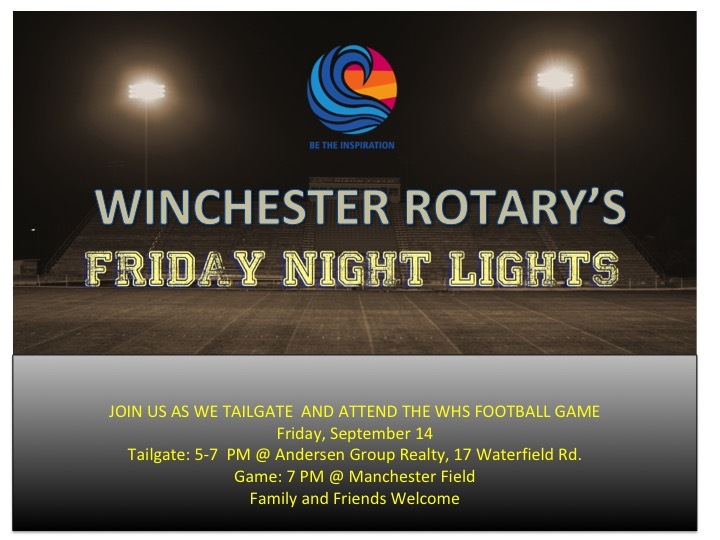 Friday Night Lights Football & Tailgate! This Thursday, our Guest Speaker is Christina Haines from Silver Lining Mentoring. First House is catering so join us if you can! The Service Membership Meeting is September 18 at First House Pub at 5:30 PM. The Chili Fest Committee will be holding its next meeting on September 18 at 4:45 PM at First House Pub in Winchester. Join us if you want to be a part of the hottest committee in the Club! The Winchester Rotary Club is pleased to announce the establishment of an annual Honorable Paul Harris Fellow Award. The award is to be bestowed upon a member of the Winchester community, who is currentlynot a Rotarian. Winchester Rotary will continue to recognize and pay tribute to our own members, it is now our organization’s intention to go outside of our membership. We would like your assistance in identifying an individual who has consistently demonstrated accomplishments that are deemed worthy of this recognition. 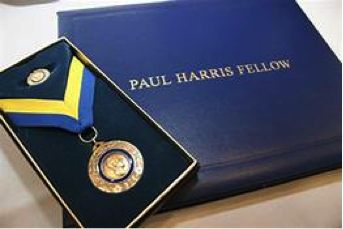 The Paul Harris Fellowship Award is one of the highest honors Rotary can give to an individual. In addition to the recipients recognition exemplifying the highest ideals that Rotary places in “SERVICE ABOVE SELF, “ this award also includes a donation of $1,000 or more, in the recipient’s name to The Rotary Foundation of Rotary International which supports Rotary’s world-wide programs. In October 2018, at a date to be determined, the Winchester Rotary Club will announce the name of the recipient at an award ceremony luncheon, open to the community. It is our sincere hope that this event will be the beginning of an annual tradition in years to come. - demonstrated personal volunteer efforts. Nominations should be submitted by no later than September 26, 2018. Click Below to Nominate Someone Now! We are all very excited about this well-deserved, recognition award. Please feel free to contact Rotarians Linda Doucette (linned818@msn.com) or Marnee Walsh (walsh424@verizon.net) if you have questions.